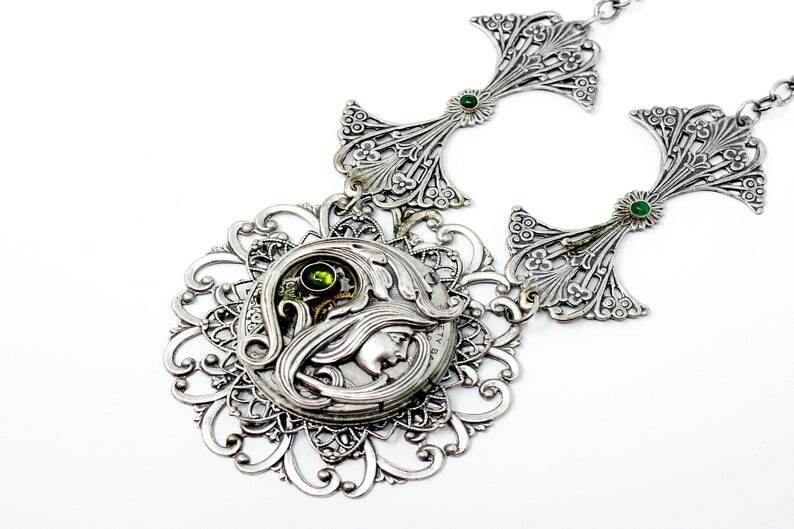 Extravagance and beauty blend harmoniously for this one of a kind handmade necklace. My inspiration for this piece can be attributed to my love of all things vintage and antiquian. With a Art Deco feel and Victorian vibe, each item I create is designed to not only look good, but also to make you feel good wearing it. The utmost attention to detail and functionality is taken to ensure that your necklace is extremely durable yet incredibly comfortable to wear. Whether you are wearing your jewelry on your wedding day, or just out getting groceries, your necklace is sure to make a stunning visual impact. Antique Hand Engraved Pocket Watch made in the early 1800's. This is in pristine condition and simply an exquisite piece of history! If over time you find that the Sterling Silver Chain is getting grimy, which is perfectly normal, gently wipe it with a silver polishing cloth (available at most General Purpose stores in the jewelry section or online). They are incredibly cheap and last a very long time. To keep your gemstones looking their best, I highly recommend getting your jewelry professionally cleaned by your local jeweler (I do not provide this particular service at this time).